THE ONLY known calving ground for the Northern right whale is located off the coasts of Florida and Georgia. From December through March, pregnant whales migrate from their northern feeding areas to the sheltered waters of the calving ground to give birth. Over the past several years, births have been up in comparison to the 1990s when the species suffered low reproductive rates. Last season, there were 28 newborns. Nevertheless, the plight of the right whale continues to be dire. This past January, two calves were found dead off the coast of Florida - most likely due to colliding with vessels - bringing the total number of right whale deaths to 11 since February 2004, based on statistics from The Humane Society of the United States. Ship strikes and entanglements in fishing gear are the leading causes of injury and death among right whales. For a population that numbers fewer than 350 individuals, the endangered whales can ill afford to lose any of their members. One resilient whale named Calvin is providing a spark of optimism to those who hope the species will recover from the verge of extinction. She is an inspiration to a group of school-children and their teacher in Castine, Maine, who want to raise awareness about endangered species. 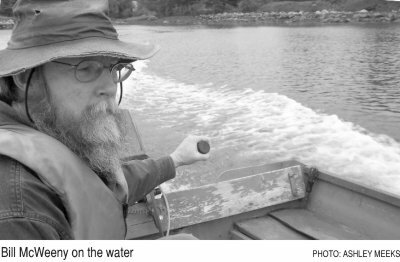 Bill McWeeny, a grade 6 to 8 science and math teacher at the Adams School who has volunteered with the New England Aquarium’s (NEAq’s) right whale team, designed a curriculum that uses Calvin’s life and right whales as a model to teach about endangered species. The plucky whale has defied the odds and managed to survive the mishaps at sea that all too often doom whales. Born in 1992, Calvin was only eight months old and still nursing when her mother, Delilah, was struck by a ship in the Bay of Fundy and died. Delilah’s death sparked a successful effort involving scientists, right whale advocates, industry and government agencies to re-route shipping lanes in Bay of Fundy to protect whales. In an unlikely outcome, the orphaned Calvin survived and returned to the Bay of Fundy the following year. At age nine, she got entangled in fishing gear and trailed line for several months before she got free. Despite her travails, Calvin has lived to become a mother. She brought her first calf to the Bay of Fundy last summer after a swim into the Cape Cod Canal. McWeeny’s students are testing his curriculum, which, he said, “makes kids reporters.” The students are assigned to research and write several articles about whales’ natural history and habitat, nutrient cycles and food chains, whales’ interactions with humans since the whaling days, and the recovery of the species under the U.S. Endangered Species Act. 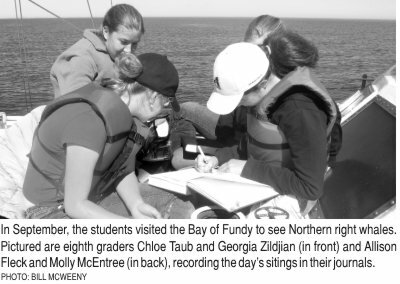 The students involved in the program have taken field trips to the NEAq’s research station in Lubec, Maine, and to Grand Manan Island, New Brunswick. Last year, they gave a presentation at a meeting in New Bedford, Massachusetts, of the North Atlantic Right Whale Consortium, a gathering of organizations and individuals working on whale conservation. They received a standing ovation. The group is working on writing Calvin’s life story, which may become a book. It will be “sophisticated” rather than “cutesy,” McWeeny said, adding that kids get excited about right whales because, like dinosaurs, they are “big, mysterious” animals. But the curriculum can be applied to other species in need of conservation, such as puffins. After this school year, the students will be “ambassadors” for the curriculum and introduce it to other schools in the area.